Dream Pod 9: HGB Peace River & NuCoal Core Plastic Miniatures Kickstarter Initial Funding Goal Reached and New Promo Graphic! Now that the initial funding goal is reached, we'll be making a big push starting today to get the word out to more gaming websites and potential new backers. 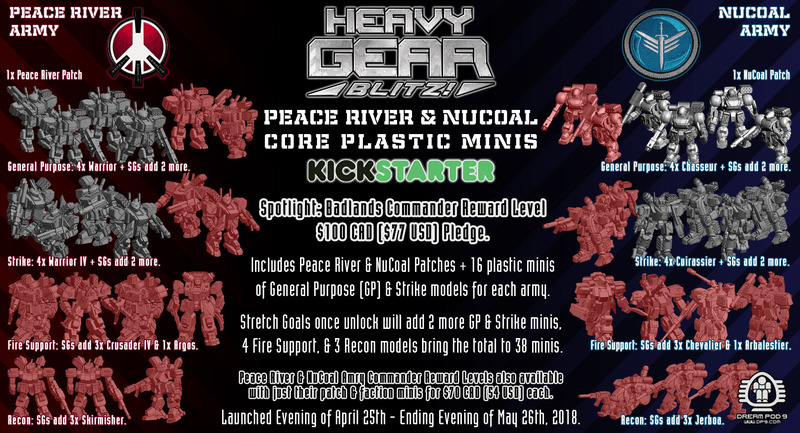 We made a new graphic today to promote the Heavy Gear Blitz Peace River & NuCoal Core Plastic Miniatures Kickstarter with a spotlight on the Badlands Commander Reward Level. Check it out below along with the promo text. Dream Pod 9's latest Kickstarter for the Heavy Gear Blitz Tabletop Wargame is now live and has already reached its initial funding goal of $25K CAD. The focus this time is Core Plastic Miniatures for our Peace River and NuCoal factions and raising the money needed to to make their expensive plastic injection molds. We have some great reward packages for our Backers to thank them for their support. The Badlands Commander reward level at a pledge of $100 CAD (about $77 USD) includes Peace River & NuCoal Faction Patches and both the Peace River and NuCoal Armies starting out with 16 plastic minis with extra weapons and parts. Stretch goals once unlocked will add an additional 22 minis, bring the total to 38 plastic minis. We also individual Peace River and NuCoal Army Commander reward levels at a pledge of $70 CAD (about $54 USD) with a Faction Patch and Army of 8 plastic minis. Stretch goals once unlocked will add an additional 11 minis, bring the total to 19 plastic minis for each Faction Army. Plus we have lots of Add-Ons available, including plastic army boxes for other factions made possible by our past Kickstarters. We need more Backers to get all our stretch goals unlocked and pay for the plastic injection molds. The Kickstarter runs until Saturday evening May 26th, 2018. Please show your support for Dream Pod 9 and Heavy Gear Blitz by clicking on the link below to check out our Kickstarter and make a pledge today! 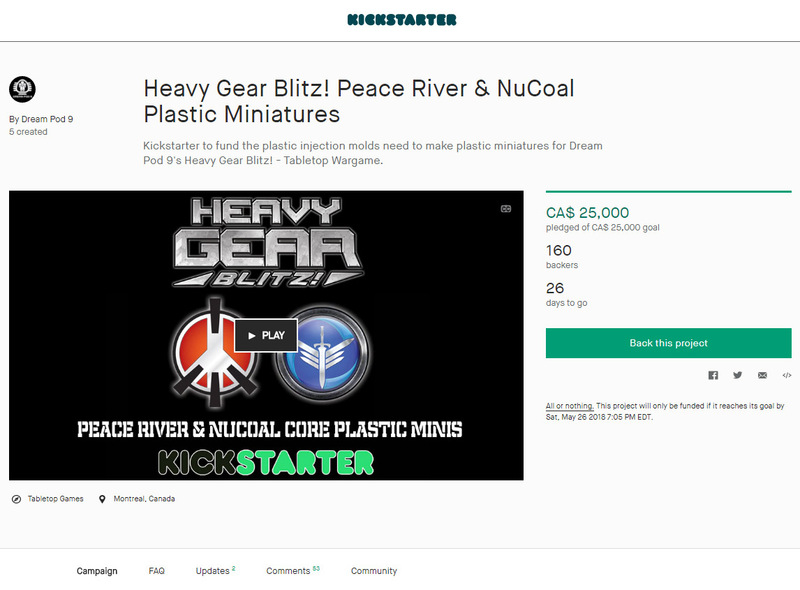 Home › Blogs › Robert Dubois's blog › HGB Peace River & NuCoal Core Plastic Miniatures Kickstarter Initial Funding Goal Reached and New Promo Graphic!